We are the members of Team GSRacers from SGSITS, Indore. GSRacers have been representing the college in BAJA SAEINDIA event since 2007. 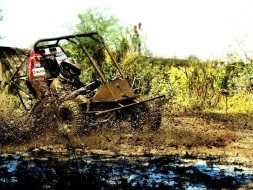 BAJA is a competitive platform for engineering students from all over the world, in which students are challenged to design and fabricate an All-Terrain Vehicle (ATV). The team was formed under the guidance of Late Dr. Kartikeya Tripathi Sirand Dr. Durgesh Joshi Sir back in 2007. 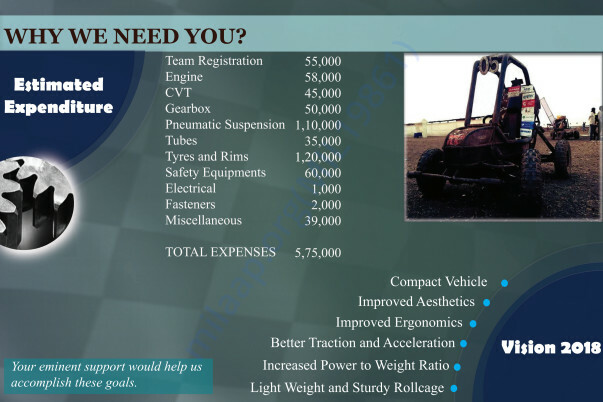 For the past 10 years, GSRacers has given a commendable performance and has left a benchmark in the event. We are ranked among the Top 10 National Teams. We are proud to inform you that ours is the only team from Madhya Pradesh to secure this position. Accolades in various segments including the 2014 Champions Trophy and Pride of Indore have been bagged by the team. It gives us immense pleasure to apprise you that the team has successfully registered itself for the Second Round of BAJA SAEINDIA 2018 event. For the current year’s event, a budget of Rs. 5.5 lakhs has been estimated. We request your contribution towards the project. The team enthusiastically appreciates your philanthropic gesture.We will be highly obliged and grateful for your consideration for the glory of the college and everyone associated with us.